Celebrate what it means to be young and filled with possibility and passion. From Jordan Matter, author of Dancers Among Us with more than 100,000 copies in print and a social media star with over 800,000 followers, comes his most irrepressible project yet, Born to Dance. Using his special gift for photographing dancers in the midst of daily life and focusing it on kids between the ages of 4 and 17, Matter captures a sense of exuberance and joy - what it must feel like to be a young dancer and perform the amazing, gravity-defying things that your body can do. Every girl and boy in the book feels that they were born to dance, and they imbue every common action - hanging at the playground, walking on the beach, eating in the cafeteria, waiting in line at the movies, playing a game with friends - with beauty, humour, and surprise. They twirl, they bounce, they stand on point, and they flip. They bend backward at an impossible angle, leap so high it makes you gasp, and jump in a way that it seems they’re levitating. The result, through Jordan Matter’s incredible ability to capture the exact right moment, is a visual appreciation of childlike joy and sadness, resilience and energy. 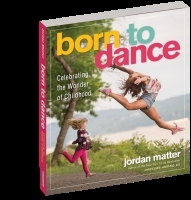 Chapters are introduced with Matter’s charming personal stories and include “When I Grow Up,” “Do They Like Me?” and “I Can Do It.” Photos are accompanied by inspiring quotes from the dancers, making it a perfect gift for every dance fan and the parents, teachers, friends, and family who support them. Telling a story that makes people gasp and smile through photography is Jordan Matter’s mission. Born To Dance does this by conveying memorable, unique, extraordinary moments and rites of childhood through amazing, often gravity-defying dance positions. Dancers from 4-17 enact sleepovers, first crushes, the joy of an ice cream cone, feeling left out, having a best friend, going swimming and many more joys and trials of childhood. A celebration of what it means to be young and full of possibility and to live life joyfully, featuring gorgeous color photographs of young dancers (ages 4-17) by Dancers Among Us photographer Jordan Matter.